The big leaguers took a two-run lead into the ninth inning Friday thanks to homers by Amed Rosario, Carlos Santana and Juan Soto, but Samurai Japan got the biggest blow of the night on Yuki Yanagita’s walk-off two-run jack against the Padres’ Kirby Yates to send the electric Tokyo Dome crowd home happy with a 7-6 win. 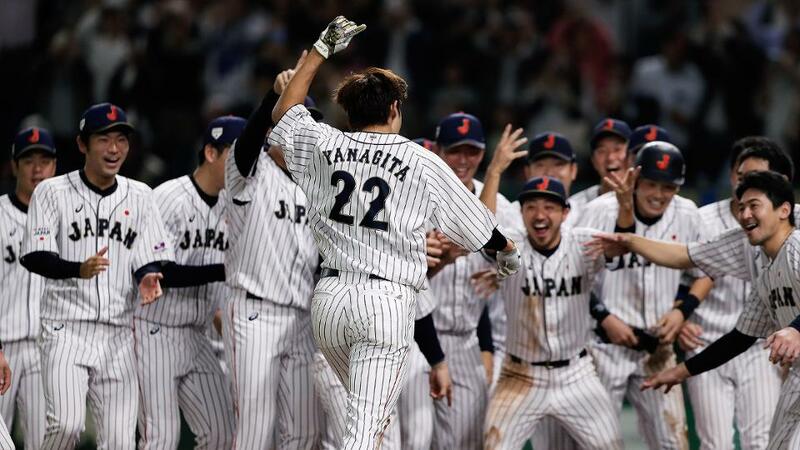 After pinch-hitter Tsubasa Aizawa kept Japan’s hopes alive with a two-out RBI single in the bottom of the ninth, Yanagita launched a two-run homer run over the center-field fence to shock Yates and his MLB teammates. Heading into the ninth, it had appeared that the MLB squad’s youngest star, the 20-year-old Soto, had put his team on top for good in the sixth when he followed Mitch Haniger‘s leadoff single with an opposite-field, two-run jack to left for a 6-4 lead. Mets shortstop Rosario got things going with a solo home run in the third inning for the first tally of the tournament. But, as would be the case through the game, Japan quickly answered. Ryosuke Kikuchi’s RBI groundout in the bottom of the frame tied the game at 1. After back-to-back singles by Rhys Hoskins and Rosario to begin the fifth, Hoskins’ Phillies teammate and MLB leadoff man Santana lined a three-run homer to left two batters later off Japan reliever Kakeru Narita. In the bottom of the fifth, Japan tied it on a bases-clearing double by No. 3 hitter Shogo Akiyama off D-backs reliever Matt Andriese. Rosario had three of MLB’s nine hits, finishing just a triple shy of the cycle. The MLB stars will attempt to even the series Saturday at 6:30 p.m. local/4:30 a.m. ET on MLB Network. Ed Eagle is an editorial producer for MLB.com.